Canada Post’s “special pane” of its 2016 NHL stamps is what a souvenir sheet has always been. It has all the NHL Great Canadian Forwards stamps identified as such, perforated and with moisture-activated gum, enhanced by embossed inscriptions and the team logos in foil. Large stamps such as this one for Sidney Crosby mimic the look of hockey cards, displaying the player’s career statistics on the back. Sold in sealed foil packs of six, the oversized $1.80 stamps pay Canada’s domestic oversize rate for nonstandard letters weighing up to 100 grams. Issued 60 years ago, the first Canadian Hockey stamp (Scott 359) depicts a forward advancing the puck down the ice ahead of his team. Canada featured NHL hockey forwards on stamps issued Sept. 23: Sidney Crosby, Guy Lafleur, Mark Messier, Phil Esposito, Steve Yzerman, and Darryl Sittler. On Sept. 23, Canada Post proudly unveiled the penultimate stamps in its five-year-long National Hockey League series. The new stamps honor six high-scoring Hall of Famers who distinguished themselves playing the national game as forwards. Forwards consist of the left wing, center and right wing, whose job it is to move the puck down the ice to score, while two defensemen and the goalie try to keep the opposing team from scoring. The 2016 NHL Great Canadian Forwards set of permanent stamps paying Canada’s domestic letter rate (currently 85¢) highlights some of the finest to play in the last half-century: Phil Esposito (who played from 1963-81), Darryl Sittler (1970-85), Guy Lafleur (1971-91), Mark Messier (1979-2000), Steve Yzerman (1983-2006), and Sidney Crosby (who continues to play for the Pittsburgh Penguins as he has done since the 2005-06 season). All six great Canadian forwards took part in the stamp unveiling ceremony at the Hockey Hall of Fame in Toronto, Ontario, Sept. 23. Canada Post notes that as a group, they played in more than 8,300 NHL games and scored more than 3,800 goals and more than 5,700 assists — more than a point per game (regular season and playoffs). Among them, they have won 18 Stanley Cup Championships. Canada Post announces 2017 commemorative stamp program: “Dear Collectors, 2017 is going to be a big year,” Jim Phillips, Canada Post’s stamp services director, writes. “Phil Esposito played for the Chicago Blackhawks, Boston Bruins and New York Rangers, scoring 1,590 points in 1,282 regular-season games over an 18-season NHL career. Esposito helped lead the Bruins to two Stanley Cup® Championships (1970 and 1972) and Team Canada to victory in the 1972 Summit Series. A 10-time All-Star, Esposito was inducted into the Hockey Hall of Fame in 1984 and Canada’s Sports Hall of Fame in 1989. The Bruins retired his No. 7 jersey in 1987. “Guy Lafleur played for the Montreal Canadiens, New York Rangers and Quebec Nordiques, scoring 560 goals and 793 assists for a total of 1,353 regular-season points over a 17-season NHL career. He reached a milestone 1,000 points in just 720 games, faster than any other NHL player before him. He won five Stanley Cup® Championships as a player with the Canadiens and was inducted into the Hockey Hall of Fame in 1988 and the Canadian Sports Hall of Fame in 1996. The Canadiens retired his No. 10 in 1985. “Darryl Sittler played for the Toronto Maple Leafs, Philadelphia Flyers and Detroit Red Wings, scoring 484 goals and 637 assists for 1,121 regular season points over his 15-season NHL career. He became the first Leaf to score 100 points in a season and also made history by scoring 10 points in a game against the Bruins on February 7, 1976, an NHL record that still stands. He was inducted into the Hockey Hall of Fame in 1989. The Leafs honored his No. 27 jersey on February 8, 2003, 27 years plus a day after his historic scoring feat against the Bruins. “Mark Messier played 25 seasons in the NHL for the Edmonton Oilers, New York Rangers and Vancouver Canucks. He is one of the game’s highest scorers, ranking second among all-time points leaders with 1,887. He scored 694 goals and 1,193 assists in 1,756 regular-season games and holds the record for most NHL games played, including playoffs — 1,992. He won five Stanley Cup® Championships with the Oilers and another with the Rangers. A 15-time All-Star, Messier is the only player to captain two different franchises to Stanley Cup® titles. The Rangers retired his No. 11 in 2006 and the Oilers in 2007. Messier was inducted into the Hockey Hall of Fame in 2007 and Canada’s Sports Hall of Fame in 2009. “Steve Yzerman was a nine-time All-Star who played in 1,514 regular-season NHL games and another 196 playoff contests over 22 seasons – all of them with the Detroit Red Wings. He scored 692 goals and 1,063 assists for 1,755 career points. He was named team captain at age 21 and became the longest-serving captain in the history of the NHL — 19 seasons. He led the Wings to three Stanley Cup® Championships (1997, 1998, 2002). In 2007, his No. 19 was retired and lifted to the rafters of Joe Louis Arena in Detroit. He was inducted into Canada’s Sports Hall of Fame in 2008 and the Hockey Hall of Fame in 2009. Avi Dunkelman and Joe Gault of Mix Design in Toronto designed the stamps, which feature head-and-shoulder images of the players in uniform and on the ice, portrayed just as fans remember them in their heyday. The 2016 NHL Great Canadian Forwards set is the fourth installment in a five-year series of NHL stamps leading up to a special 2017 issue marking the 100th anniversary of the NHL. The series began with the NHL Team Jerseys stamps in 2013 (Scott 2669-2676), and continued with the Original Six Defensemen set issued in 2014 (2786-2793), and the Great Canadian Goalies in 2015 (2866-2878). With this issue, Canada Post has produced about 70 NHL-themed stamps since 1992, and more than 86 hockey-themed stamps since 1956. In fact, a pane of six 48¢ NHL Stars stamps issued in 2002 pictured both Guy Lafleur (Scott 1935b) and Phil Esposito (1935f). The earliest of Canada’s hockey stamps was issued 60 years ago, in 1956 (Scott 359), from a time when stick blades were straight, no one wore helmets, and all the pads were leather, canvas and felt. The 2016 issue is available as self-adhesive, die-cut stamps measuring 40 millimeters by 32mm in booklets of six printed by Lowe-Martin on Tullis Russell paper with seven-color lithography. The booklet cover displays a tightly cropped image of honorees Lafleur and Sittler in action. The nonstamp labels feature embossed, foil logos of the NHL and an embossed image of crossed hockey sticks and a puck. According to Canada Post, 90,000 special panes have been produced this year, a 40 percent reduction from the 152,000 special panes printed for last year’s NHL Goalies issue. Given that six-stamp booklets (Canada Post order No. 41402311) and special panes (404023107) each sell for $5.10 Canadian, and that 580,000 booklets have been printed, the panes would appear to be more likely to appreciate due to the much smaller quantity produced. Using the self-adhesive booklet versions of the stamps, Canada Post is producing 12,000 first-day covers for each of these players, each postmarked in the town where the forward was born, with the logo of the NHL team with which he was most commonly associated. Measuring 190mm by 112mm, these FDCs may be ordered individually for $1.85, or in a complete set of six for $11.10 available online or by mail-order only (No. 414023131). Described by Canada Post as “souvenir sheets,” vertically formatted 52mm-by-78mm $1.80 stamps resembling hockey cards and featuring full images of the players in action also are available. These $1.80 stamps pay Canada’s domestic oversize rate for nonstandard letters weighing up to 100 grams. On their backs, as on hockey cards first popularly collected in the early 20th century, are printed career statistics that tell part of each player’s professional story. Complete sets of six (called “packs” by Canada Post) are sealed in a foil pouch, as modern sports cards often have been. Sealed packs of six containing one of each design are available for $10.80 Canadian (404023145). 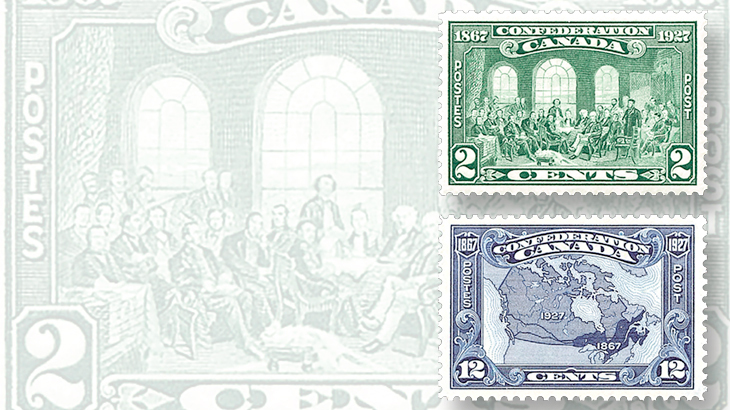 Great Canadian Forwards stamps and related items are available at the Canada Post's website. Stamps and FDCs are available by mail order from Canada Post Customer Service, Box 90022, 2701 Riverside Drive, Ottawa, ON K1V 1J8 Canada; or by telephone from the United States or Canada at 800-565-4362, and from other countries at 902-863-6550. One last spooky set: Which spine-tingling sites are on the final five Haunted Canada stamps?